Born in nuclear fire, they stride across the face of the world, unstoppable. They are the Kaiju - giant monsters that have ravaged the nation of Japan for decades. There is only one force that can stand against these titans of destruction - the Mecha Assault Force! Created by the greatest minds of an island nation, the giant robots of the M.A.F. 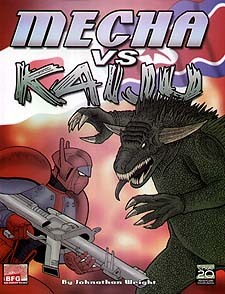 stand ready to do battle against the monstrous might of the Kaiju! In Mecha vs. Kaiju you take the role of a fearless mecha pilot in this anime-inspired True20 setting. Craft your character based on the Archetypes of Japanese comics and animation. Tailor every aspect of your own personal mecha - from the inside out - with movement for any terrain, stout protections, and custom-designed weapons. Narrators will find complete rules for creating their own monstrous Kaiju, as well as an in-depth setting guide, introductory adventure, and campaign guideline. Here you will uncover the secret history of Japan, containing a wealth of story possibilities, to inspire your own battles in the relentless, never-ending battle of Mecha vs. Kaiju!